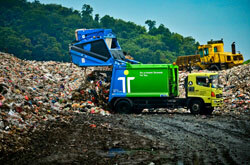 Sanitary Landfill (for Municipal Waste) | Trienekens (Sarawak) Sdn. Bhd. 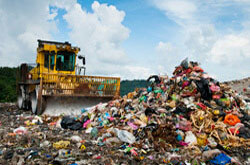 The Sanitary Landfill caters to the disposal of municipal waste from the city of Kuching. The primary target of a modern landfill design is to minimize or eliminate adverse environmental impacts arising from the disposal of municipal solid waste which typically contains a wide range of pollutants. To avoid any leaching of pollutants into groundwater, the landfill is constructed with a multi-layer base sealing system, comprising of a highly impermeable sealing layer using the latest environmental protection material, covered by geotextile and a drainage and filtration layer to ensure undisturbed flow of the leachate wastewater into the embedded leachate collection pipes, at all times. Landfill gas consisting mainly of methane is extracted and collected through a web of gas collection pipes in various levels of the landfill body. In initial stages the gas is pre-treated and flared off for neutralization; once sufficient amounts of gas is generated, the gas extracted will be used for power generation which will further contribute to the conservation of natural resources, further fulfilling the main objectives of the overall facility design and operations.